Motivational keynote speaker Karen Lynn-Chlup whispers hope and shouts a challenge to change the landscape for people with disabilities. Envisioning a world where disabilities aren’t barriers, Karen advocates for better schools, health care, playgrounds, and job opportunities. She engages with individuals to empower themselves. It all starts with changing perceptions, and Karen’s audiences walk away questioning old limitations and adapting to new ways of thinking. Karen inspires those living with a disability to accept themselves unconditionally and to learn to push through barriers. She inspires her audience with her own experience of life accomplishments people told her she’d never do—learn to dance, read and write, go to college—and motivates people to see beyond others’ perceptions and limiting assumptions of their capabilities. Living with cerebral palsy and a learning disability, Karen experienced “You can’t” and “You’ll never . . .” a lot, but it never stopped her. Karen refused to be what people expected, and she brings both warmth and her “refuse to settle” attitude to her speeches. Karen’s audience learns how to be more inclusive of individuals with disabilities in everyday decision making and actions. They’ll learn how to challenge old processes and thinking in productive ways as she compels each person to continually be learning and finding ways to be better advocates for the community of people living with disabilities – and themselves! 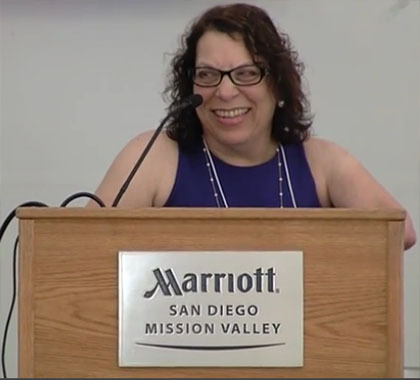 Whether a person with a disability or a family member, teacher, advocate or caregiver, audience members will leave Karen’s presentations on cerebral palsy and disability awareness inspired and armed with real tactics to facilitate change at the individual level and on a larger community scale. Bring Karen’s message of empowerment and inclusion to your organization or upcoming event.